Obelisk is another welcomed addition to the Barracuda group. It offers a traditional British menu that you can enjoy within a friendly and sociable setting and is well known for its good range of real ales. Do you work at Obelisk? What did you think of Obelisk? Chingford epitomises the normality and agreeability of London suburbia and the Obelisk is an appropriately normal and agreeable pub. It offers a full drinks selection, including a growing Real Ale choice and value food. These will appeal to the no-frills tastes of locals. The Barracuda Group revamped the Obelisk in 2008. The appealing entrance is on a shopping parade and there’s a group of outdoor rattan chairs and tables to give a summery aspect. Inside is one spacious and long bar and the décor is still fresh-looking with contrasting colour shades of wallpaper. The numerous tables are of mid-brown wood and the accompanying chairs, sofas and tables are, mostly, comfortably upholstered in red or green leather. One long servery occupies one side of the bar and beyond this at the rear is a discrete family area, which even has baby changing facilities. Obelisk operates to appeal to a full cross-section of Chingford folk. Morning breakfasts attract mums looking for a catch-up after the school run. Lunchtimes are busy with local shop and office workers after inexpensive meals. Retired people pop in during the afternoon and evenings bring in a younger crowd, although there are plenty of other age groups present, too. A Thursday night quiz is popular and DJs play music on Friday and Saturday nights which, given local tastes, provides easy listening. The big attraction, however, is TV sports, with many enjoying the intensity of matches - football especially - when shared with other enthusiasts. Screenings of big games are always busy times at the Obelisk. Value pricing characterises the Obelisk food offering. Breakfast can be a £1.99 bacon sandwich and tea or a full English only £3.69 or £3.25 for the Vegetarian version. A wide selection of food is available after midday, with sandwiches, wraps, baked potatoes, pasta and noodle meals all on offer. Keen pricing means that some of the dishes can be bought at £6.49 for two. Burgers and steaks are very popular and the most expensive dishes are a 16oz rump steak or ribs and chicken combo with full vegetable accompaniment, both costing £10.99. 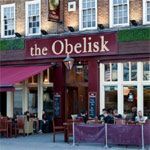 Lager is the mainstay at Obelisk – there’s Foster’s, Carling, Stella Artois, Beck’s Vier, Peroni and San Miguel. Barracuda is also making an effort to benefit from the Real Ale renaissance with beer festivals being held on occasions to widen appreciation. This has paid off at the pub, which now has between three to five handpumps in use on the bar. Favourites are Wells Bombardier and Sharp’s Doom Bar but also available can be Jennings Cocker Hoop, Morland Old Golden Hen or Greene King IPA. The house wine range is from the South African Kumala producer. Buying two 250ml glasses gets you the rest of the bottle free – an additional fifty per cent for your money. Spirits and liqueurs are standard, with Jack Daniels whiskey and Smirnoff vodka appealing to locals. And the Jaeger Bomb is popular here – a potent mixture of Jaegermeister and Red Bull goes down well with the younger crowd. The Obelisk gives the people of Chingford what they want. It’s unpretentious and unexceptional, but its popularity shows that supplying an acceptable selection of drink and food at competitive prices reels in the punters.